I believe that anything that has the appearance of evil is wrong. Murder is wrong and I see the death penalty as a form of murder. It is not the case that even if a person has killed another that we should go and kill that person. It is wrong to take revenge on people. It is wrong that the government justifies murder calling it justice; wrong is wrong. I was arguing this point in class and to everyone else that will hear; especially, to those who want to take the word of God and use it. I note, that to use the verse that implies“an eye for an eye, and a tooth for tooth” is totally taken out of context in this instance. If God is the giver of life, then is he really in agreement with using the death penalty? Is not life special, precious no matter what a person has done? I argue then that it not justice to kill under any circumstance, because of the way that these people are killed in deployable conditions such as gas and electrocuting. It is seen that it is even against the law of the land for a soldier to torture an enemy who has sinned against us in such a manner. How is it then that we can take one of our own citizens and torture them? “For example, according to Dr. T Bernstein of the Wallace-Kettering Neuroscience Institute at Wright State University, writing in Medical Instrumentation in 1975, two doctors by the name of Prevost and Battelli demonstrated in 1899 that death from electrocution was caused, not by damaging the brain, but by high voltages of electricity causing very rapid irregular contractions of the heart (ventricular fibrillation) eventuating in the heart stopping” (Juan, 2006). It is instinctive to want a loved one who has been murdered to be avenged, but is it right that we should take another’s life to avenge a death. I ask will it bring the loved one back, and what about the other family. Murder is wrong, and it is not justice to torture another human being. People say that one turn deserves another, but I say not that way. It is better to allow them life in prison than to end a life that way. I watched a show where an inmate who was scheduled to die was allowed last requests and wishes. One ordered a bacon, tomato, and lettuce sandwich which I find totally senseless, because what good can come from feeding them when the food will not digest and will become stomach contents in the autopsy report. Also, a chef was called in to prepare the meal which I see as a waste of taxpayers money when people are already screaming about funds. It is ludicrous to make light of death just to have something to report on the local news. Imagine what will happen to the sandwich when electricity is poured into him. Juan says, “In one US state, the protocol calls for a jolt of 2,450 volts that lasts for 15 seconds. After a 15 minute wait, the prisoner is then examined by a coroner. After 20 seconds, the cycle is repeated. It is repeated three more times. The body may heat up to approximately 100°C (210°F), which causes severe damage to internal organs. Often the eyeballs melt.”(Juan, 2006). It is a horrible way to die, and I believe that no one in their right mind who has a conscience should allow the Death Pentalty to continue. People place more passion and interest in interfering in gay rights than this issue. Lastly the author writes, “Although death is supposedly instantaneous, some prisoners have been known to shriek and even shout while being executed in this way. There have been reports of a prisoner’s head bursting into flames. There have been reports too of a prisoner being removed from an electric chair that has malfunctioned part way through the electrocution and then being placed back in the chair once it is fixed in order for the job to be finished. Some skin is burned off the prisoner. 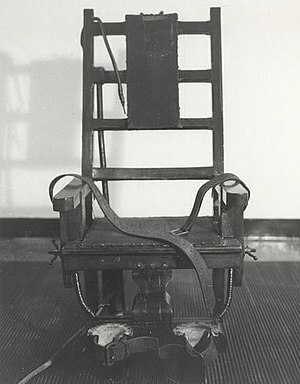 The burned off skin must then be scrapped off the seat and straps of the electric chair before it may be used again” (Juan 2006). America, the free and the brave has become barbaric and cowardly. Murder is wrong. The audience I speak to are those who cannot seem to shake the act of revenge, and those who say they care for human life and who seem to have no problem taking one. Those people who say that genocide is horrible, that murder of women and children is horrible, but can sit and watch someone slain and call it justice. This entry was posted in Education, Ethical, Opinion, Political and tagged Capital punishment, Electric chair, God, Human, Life imprisonment, Murder, United States, Wright State University. Bookmark the permalink.